A growing body of evidence suggests that if bike lanes and parking removal are part of a general plan to slow traffic, everybody can win. 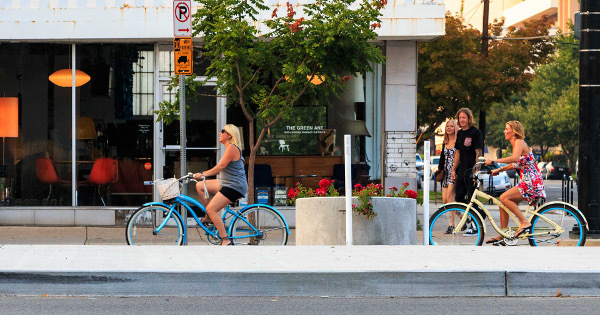 In an in-house study of its new protected bike lane, Salt Lake City found that when parking removal was done as part of a wide-ranging investment in the streetscape — including street planters, better crosswalks, public art and colored pavement — it converted parking spaces to high-quality bike lanes and boosted business at the same time. 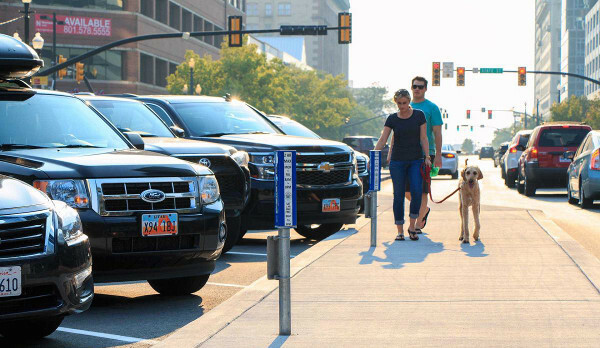 On 300 South, a street that’s also known as Broadway, SLC converted six blocks of diagonal parking to parallel parking and also shifted parallel parking away from the curb on three blocks to create nine blocks of curb-and-parking-protected bike lanes on its historic downtown business corridor. It added up to a major road diet on part of the street (from five general travel lanes to three) and much less auto parking on another part (a 30 percent cut total). Using its sales tax data, the city compared retail sales along Broadway in the first half of 2013, before the changes, to the first half of 2015. Along the project, sales rose 8.8 percent, compared to 7 percent citywide. 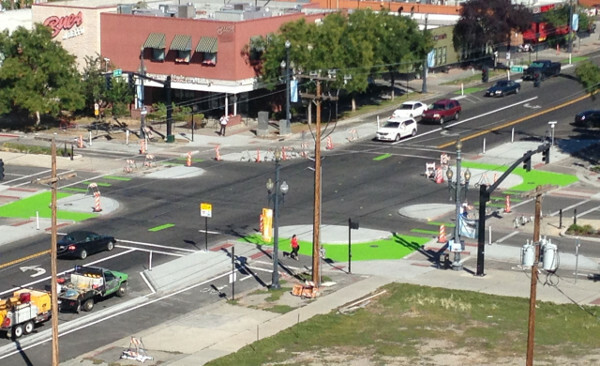 On Oct. 17, the city is planning to celebrate these great results, along with the official opening of one of the country’s first protected intersections, at SLC’s first Biketoberfest block party downtown. How could adding bike lanes make sales go up? One way, of course, is that they increase bike traffic on the street. Customers arriving by bike not only tend to be more loyal, they also require much less parking space per wallet, so it’s the best kind of traffic for a business. Bike traffic jumped 30 percent after the bike lane’s installation, the city found. But that’s probably not the main reason for the sales jump. 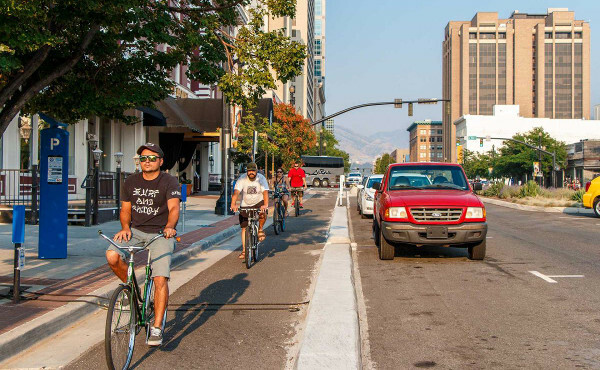 Instead — as on New York City streets, which found extremely similar results in a similar 2013 study of sales tax data — Salt Lake City’s experience shows that bike lanes are typically best for business when they’re part of a general rethinking of the street to make it a more pleasant place to linger. “I think the key thing is the feel of the street,” said Phil Sarnoff, executive director of Bike Utah. Sarnoff said that the thanks to the parallel parking and fewer lanes, car traffic had slowed down and more people in cars tend to stop for people at crosswalks. Where Broadway intersects with 200 West, the streets will get a protected intersection to improve biking and walking safety. That’s why even the owner of a plant store, John Mueller of Paradise Palm on Broadway, can see sales go up as a result of a project that makes biking easier. Becka Roolf, SLC’s bike and pedestrian coordinator, said that even people who drive to shop downtown spend much of their time walking from place to place. That’s why the walking experience on Broadway seems to be more important to business there than the speed at which people can drive past or the ease of finding a parking spot.